Dentine hypersensitivity is a very common dental condition. It has been defined as a short, sharp pain arising from exposed dentine response to thermal, chemical, tactile, evaporative stimulus, and which cannot be related to any other dental defect or pathology. The reports indicate that prevalence of dentine hypersensitivity is 4-74%. ,, The variation in prevalence can be due to a number of factors which may include different methods to diagnose the condition, type of population studied, and other subjective variations. There are no studies to our knowledge in the literature about prevalence of dentine hypersensitivity among the Indians with an oral examination. Most of the studies about the prevalence of dentine hypersensitivity in the literature have been conducted mainly in the teaching institutions. ,, The rural population may have a lot of barriers preventing them to attend the dental clinics/institutes which are mainly situated in urban settings. A number of people with mild tooth sensitivity do not visit the dentist. Therefore, it may be difficult to get the actual prevalence of dentine hypersensitivity in the population. Dentine hypersensitivity has been extensively studied and most of the authors are in agreement about the fact that this problem is either under-reported or misdiagnosed. The unsatisfying effects of the desensitizing treatment methods and post-treatment sensitivity produced by the iatrogenic factors like oral hygiene care are also being studied. Gingival recession has also been considered as a very common risk factor for dentine hypersensitivity. The other possible risk factors like smoking are also not clear and need further investigation. Therefore, the extent of this problem in the rural population of India is not known. The purpose of this study was to do a cross-sectional study of the rural population of Punjab in the district of Faridkot and Ferozepur. The sample was random and dentine sensitivity after treatment and scaling was also noted. The study design was cross-sectional and the sample was taken from the five adjoining villages from the districts of Ferozepur and Faridkot. The oral test was conducted by one examiner only. The examiners were trained for the oral test. The diagnosis of hypersensitivity was made by using a blast of air from a 3-way syringe for 5 s at a distance of 1 cm from the tooth surface and the reaction recorded. The informed consent was signed by each subject participating in the study. The subjects in the age range of 20 to 69 years experiencing dentin hypersensitivity were included in the study. The subjects were divided into five age groups. Females and males from all the age groups were randomly recruited into the study. Total 650 subjects were selected from five villages falling under the jurisdiction of the districts of Faridkot and Ferozepur of Punjab. The subjects were informed about the examination by an assistant. The questions about the age, gender, and education level were asked. The questionnaire also included pain inducing stimulus. The questionnaires were recorded regarding the subject's age, gender, and education level. The questions regarding pain inducing stimulus, treatment by desensitizing toothpaste, and any smoking habit were noted. The diagnosis of hypersensitivity was made by using a blast of air from a 3-way syringe for 5 s at a distance of 1 cm from the tooth surface and the reaction was recorded. The recession associated with these teeth was also measured using a graduated periodontal probe. The following subjects were not included in the study population; these criteria have reference to Gillam's study.  . Orthodontic appliance treatment within previous 3 months. Statistical analysis was made using SPSS version 13.0. The difference between the sexes was compared with the χ2 test. The significant level P≤0.05 was considered statistically significant. The prevalence of hypersensitivity was 48.9% and a total of 650 subjects reported hypersensitivity in the questionnaire evaluation [Table 1]. The females presented with a higher prevalence of sensitivity than the males. The subjects who reported hypersensitivity symptoms, only 15.1% had received professional treatment. Those who did not plan to seek treatment were 72.6%. The use of desensitizing toothpaste was reported by 75.8% of subjects, in which 1.1% reported complete elimination of hypersensitivity, 36.2% reported that it was ineffective against hypersensitivity, and 38.5% reported some relief from hypersensitivity symptoms. The subjects who received periodontal treatment, 46.3% reported slight sensitivity, 20.1% obvious sensitivity, and 26.2% said that they are scared of undergoing periodontal treatment because of the hypersensitivity [Table 1]. The oral test was done in 350 subjects who had dentine hypersensitivity. Therefore, the overall prevalence was 25%. Female subjects had a higher prevalence figure than the males in the oral test as well. The age group of 50-59 year had the highest number of subjects with dentine hypersensitivity, whereas the 20-29 years old age group had the least in the questionnaire. The most common provoking factor was the presence of cold stimulus followed by sweet. Most of the subjects were experiencing hypersensitivity symptoms for more than 3 years [Table 2]. 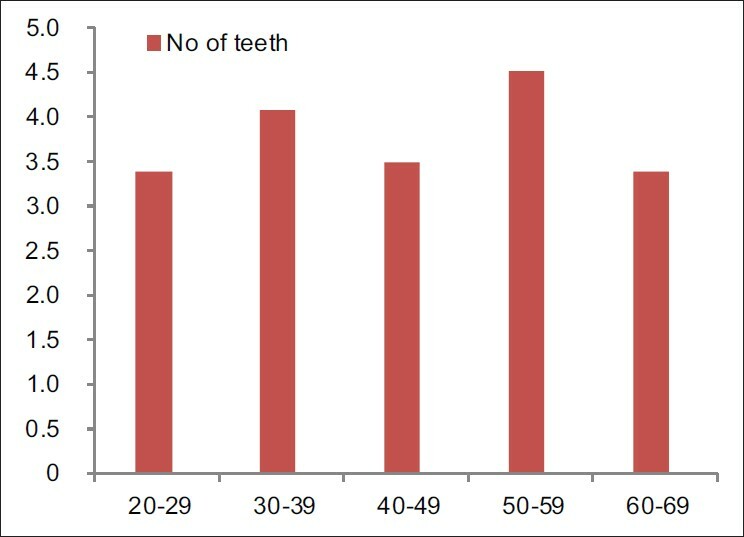 The mean number of sensitive teeth per subject reached a peak of 4.52 in the 50-59 years old group and 4.08 in the 30-39 years old group [Figure 1]. The most commonly affected tooth was lower premolar and the second molar was the least affected tooth. Single factor covariance analysis was completed with the number of teeth affected by dentine hypersensitivity as an independent variable and age, gender, education level, smoking, gingival recession, and attachment loss were taken as dependent variables. Females with low education level (P<0.05), gingival recession (P<0.01), and attachment loss (P<0.01) were associated with dentine hypersensitivity. This was a cross-sectional study. The sample population was Punjabi Indian village adults and was the major difference from the previous studies. This study has found that the total prevalence of dentine hypersensitivity was 48.9% in the questionnaire group and 25% in the oral testing group. Some studies that have been carried out with questionnaires had reported values of more than 50% or less than 20%. , The studies from academic setting have reported values of 30% or more. ,, There are studies from dental practices which have reported prevalence values from 4-15%. , The differences may be due to the type of sample and methods used in the studies. Keeping in mind the subjective nature of dentine hypersensitivity, all the subjects were not examined in the study. In fact some subjects without subjective feeling may also exhibit this problem. Additionally, the only method of blast of air may not be the diagnostic factor for all the subjects. Therefore, the prevalence in this study was expected to be slightly less than the actual prevalence of dentin hypersensitivity. Some previous studies have also reported on the age distribution of dentine hypersensitivity, resulting in every age group being reported as the peak prevalence age group. ,,, In our study, the peak prevalence in the age group of 50-59 years for both the number of subjects suffering from sensitivity and the mean number of sensitive teeth per sensitive subject. The study of Liu et al. reported the same age group with greatest number of subjects in Taipei. A surprising finding in this study was that the value of mean number of sensitive teeth per sensitive subject in the 30-39 year old group was as high as the 50-59 years old group. The Canadian Advisory Board on Dentine Hypersensitivity  also considered that the prevalence of Dentine hypersensitivity could be underestimated for the young adult population in their report. This population should be given attention and related risk factors should be further studied. The most common stimulus cited in the literature is response to cold. This was also found to be true in our study. The second most common stimulus was sweet stimulus in this study which is not in agreement with other previous studies. ,, Most of the studies have shown that the second most common stimulus was heat. ,, In our study, a sweet stimulus was mainly produced by intake of sweet food. There was sensitivity to sour stimuli as well. Our study did not find any correlation of dentine hypersensitivity with smoking. Even though smokers will have more severe periodontal disease and attachment loss. In a study by Rees et al.,  it was reported that dentine hypersensitivity may be more prevalent in the higher social groups but the sample may be biased by the fact that a number of regular attendees at dental surgeries belong to this social group. In our study, people with low socioeconomic background had more teeth with dentine hypersensitivity. It was not very clear whether higher prevalence of dentine hypersensitivity was related to degree of oral care. It has been seen that dentine hypersensitivity occurs more commonly in females  and in teeth with gingival recession. The results of our study also are supportive of these findings and periodontal attachment loss and gingival recession as factors responsible for dentine hypersensitivity. Attachment loss happens prior to gingival recession which exposes the cementum and dentine which is prone to hypersensitivity. In conclusion, this cross-sectional study on dentine hypersensitivity in Punjabi Indian rural adult population showed that the prevalence in 20-69 year old subjects is 25%. 1. Holland GR, Narhi MN, Addy M, Gangarosa L, Orchardson R. Guidelines for the design and conduct of clinical trials on dentine hypersensitivity. J Clin Periodontol 1997;24:808-13. 2. Rees JS, Jin LJ, Lam S, Kudanowska I, Vowles R. The prevalence of dentine hypersensitivity in a hospital clinic population in Hon Kong. J Dent 2003;31:453-61. 3. Murray LE, Roberts AJ. The prevalence of self reported hypersensitive teeth. Arch Oral Biol 1994;39:129S-35S. 4. Irwin CR, McCusker P. Prevalence of dentine hypersensitivity in a general dental population. J Ir Dent Assoc 1997;43:7-9. 5. Rees JS. The prevalence of dentine hypersensitivity in general dental practice in the UK. J Clin Periodontol 2000;27:860-5. 6. Walter PA. Dentinal hypersensitivity: A review. J Contemp Dent Pract 2005;6:107-17. 7. Kehua Q, Yingying F, Hong S, Menghong W, Deyu H, Xu F. A Cross-Sectional Study of Dentine Hypersensitivity in China. Int Dent J 2009;59:376-80. 8. Gillam DG, Aris A, Bulman JS, Newman HN, Ley F. Dentine hypersensitivity in subjects recruited for clinical trials: clinical evaluation, prevalence and intra-oral distribution. J Oral Rehabil 2002;29:226-31. 9. Orchardson R, Gillam DG. Managing dentine hypersensitivity. J Am Dent Assoc 2006;137:990-8. 10. Liu Hc, Lan WH, Hsieh CC. Prevalence and distribution of cervical dentine hypersensitivity in a population in Taipei, Taiwan. J Endod 1998;24:45-7. 12. Fischer C, Fischer RG, Wennberg A. Prevalence and distribution of cervical dentine hypersensitivity in a population in Rio De Janerio, Brazil. J Dent 1992;20:272-6. 13. Canadian Advisory Board on Dentine Hypersensitivity Consensus-Based Recommendations for the Diagnosis and Management of Dentine Hypersensitivity. J Can Dent Assoc 2003;69:221-6. 14. Nield-Gehrig JS, Willmann DE. Foundations of Periodontics for the Dental Hygienist. Philadelphia, PA: Lippincott Williams and Wilkins; 2002. p.266-7. 15. Orchardson R, Collins WJ. Clinical features of hypersensitive teeth. Br Dent J 1987;162:253-6. 16. Rees JS, Addy M. A cross-sectional study of dentine hypersensitivity. J Clin Periodontol 2002;29:997-1003. 17. Flynn J, Galloway R, Orchardson R. The incidence of hypersensitive teeth in the west of Scotland. J Dent 1985;13:230-6. 18. Salvi GE, Lawrence HP, Offenbacher S, Beck JD. Influence of risk factors on the pathogenesis of periodontitis. J Periodontol 2000;14:173-201. 19. Uchida A, Wakano Y, Fukuyama O, Miki T, Iwayama Y, Okada H. Controlled clinical evaluation of a 10% strontium chloride dentifrice in treatment of dentine hypersensitivity following periodontal sugery. J Clin Periodontol 1980;51:578-81.